Round 7 was Indigenous Round at The Nest with a massive turnout. We had a great Indigenous ceremony prior to the game and during halftime the Auskickers has a chance to showpiece their stuff in front of a packed crowd. This was a much anticipated game for all, against a side that had threatened to be a challenge and boy oh boy we were waiting. 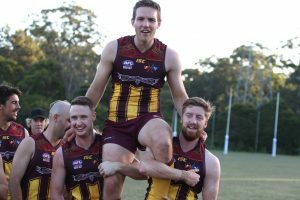 Let’s not forget the big man down back Zac Metcalfe playing his 100th game for the maroon and gold. Zac would easily be the best Backman in the League and can not only play exceptional footy, he is one of the best blokes at the club. Zac has this ability to be so authentic with his words and you just know that his love of Cardiff runs deep in his veins. Zac kicked a goal of the season early in the game and gee whizz didn’t the crowd get up and about. Another senior debutant this week was Jackson Terley (Kicked goal of the day) and after his mother presented the young boys’ jumper we were ready to go. This game started with us receiving a few early free kicks with Maitland attempting to throw their weight around. This didn’t move us in any way but unfortunately, Maitland kicked the first goal before we were able to put our first majors on the board through Jack Lennon and Andrew Walker. We went into the first break a goal up but looking the better side with eight scoring shots to four. The second was much of the same but unfortunately in a sickening blow young gun Lachlan Price received a kick to the face from a Maitland player. These constant incidents by Maitland seemed to have us lose our focus of the game and we went into the big break only two goals in front. We had a good chat at half-time as we had lost the way we play and move the ball. This may have been due to the pure emotion of the game with us not concentrating on what we needed to do. After a constructional chat, we come out absolutely firing on all cylinders. We kicked 17 goals to one in the second half and this was a display of absolute dominance. No matter what Maitland threw at us we just kicked goal after goal. Andrew Walker displayed a power forward role and was outstanding. 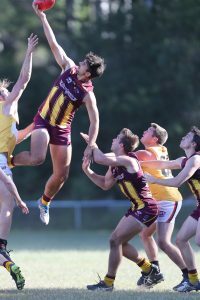 Andrew took over ten contested marks and was simply captivating with his aerial skill. 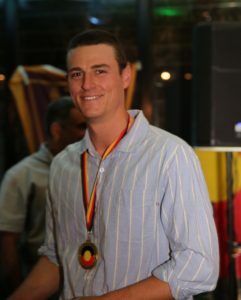 A bag of 5 goals saw Andrew received the Michel O’Loughlin Medal for a Best On Ground performance. Lachlan Price chimed in with seven goals with another impressive game as did Jack Lennon 4, Josh Murphy 3. A Special mention needs to go to Marcus De Leur with his 1 goal 6 behinds as a nice little cameo up forward in the second half. All jokes aside, Marcus was ferocious with his clearance work. Marcus lead throughout the game with his partner in crime Simon O’Brien with both dominating the middle all day. Bryce Graetz was also impressive with outstanding physical presence around the ground. Bryce displayed good old fashion hits that will no doubt keep the Maitland midfield sore all week. Bryce has now, in my opinion, put himself up with the best midfielders in the League. We are all looking forward to seeing Bryce’s constant rise in form and his pure dominance in the middle continue. Big fella Tom Yensch received a vote from the coaches as his ruck work was a massive reason our clearance count was high. Tom sat behind the ball most of the day, reading the play and was not challenged at all really due to his impressive air dominance and mobility throughout the ground. Luck to get a game Dave O’Donnell was exceptional this week. Dave read the ball better than I have ever seen him and his rebounds hitting targets named him best Backman for the day. Liam Gibson and Zac Metcalfe were also solid with Liam having a run up forward again playing a very important versatile role. Goal kickers : L. Price 7, A. Walker 5, J. Lennon 4, J. Murphy 3, Z. Metcalfe, M. Peterson, M. Deleur, N. Thomlinson. Coaches Award & Michael O’Loughlin Medalist: A Walker. 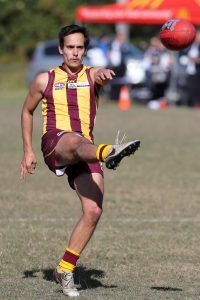 Round 7 saw us back at The Nest as we welcomed the Muswellbrook Cats. Our match against the Cats again was about the start. We may not have won the first clearance however we won the footy back quickly and went inside fifty where it basically stayed for the rest of the quarter giving us a healthy lead at the first break. With Claudia and Tayla G starting to dominate the center bounces our mids were capitalising with Arizona, Bri, Abbey and Grace all doing great things, constantly getting the ball going forward. Our forward line set up has improved greatly giving Eva and Mollie more opportunities to score. Still leading comfortably at the long break the cats weren’t about to lie down and they kept pushing. But fortunately for us, our girls had their tails up and playing good footy. Despite a healthy lead, we were not giving up any points to the opposition. When the Cats did get the ball going forward it was cleared without any real threat. 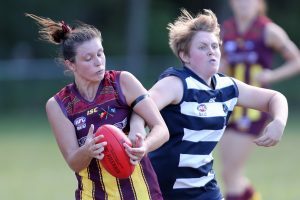 Faith played well at the back and managed to moved forward and kicked a goal. Shez, Nicola W, Eloise, Katie and Sam K all played well in the backs. 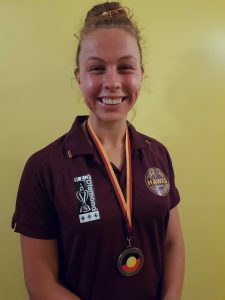 Unfortunately deep into the third quarter, tragedy struck and Abbey went down with another painful shoulder injury and it would’nt be long before our worst fears were realised and an X-ray confirmed another broken collarbone. The disappointment is clear for all to see as Abbs looks down the barrel at another lengthy stint on the sidelines. 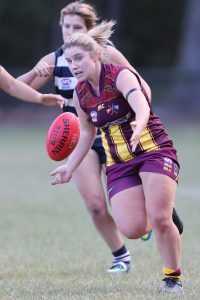 Abbey just loves the game and has been in good form also and is going to miss running out with the birds more than I care to think about. Just devastated for her. The last quarter was something a bit special as we had kept a team scoreless for three quarters so how hard would we play with a lead of about 100 points. We could have been forgiven for relaxing and letting some soft points in and still win the game. But not this lot, they stuck to their work and continued to score while defending to the end and holding their opponents scoreless for four quarters. It was this that summed up our game as much as the points scored. Fantastic effort birds. The goals went to Mollie 4, Eva 3, Arizona 3, Min 2, Claudia 2, Abbey 1, Amy 1, Faith 1, Sara 1, Nicola W 1. Arizona, Bri, Claudia, Mollie, Shez. The undefeated Muswellbrook headed to the nest full of confidence ahead of their clash with us the reigning premiers The Cardiff Hawks. With a year of experience gained in the Black Diamond Plate competition, The Cats were always going to stretch a Cardiff side who had several key outs including one 10 minutes before the match. Our habit of starting off poorly again showed its ugly face with the Cats scoring within the first couple of minutes of the bounce and one goal quickly became two. Their pressure around the ball was great, as was their confidence and execution. Our pressure was average, we missed 8 consecutive targets and we were handing the Cats the game on a platter. Towards the end of the quarter, we started to hold the ball, our voice got louder, as did the confidence, which tamed the Cats to a degree. Mick Ryan, who again kicked 7 goals, scored a couple of late goals in the quarter to turn around what was an average first stanza. Rhino and Cam Jones again proved the difference up front. The second quarter was an arm wrestle with both sides trading goal for goal for most of the period. We were losing the ruck contests but due to the best on ground performance from Callum Spoor we were winning the clearances and staying in touch on the scoreboard. Our defensive unit was inspirational for the whole game but importantly fought off wave after wave of The Cats late in the second stanza. John Irish O’Regan was outstanding as was Reagan Bowe who took several crucial contested marks. The return of Andrew Risby was a handy addition to our backline on a day where every contest counted. Third quarter the Hawks chose to hold the ball, play our structures, and hit our targets. This was set up from our midfield who absolutely dominated the majority of the third term. Peter Bleus take a bow. Despite being an emergency, on dad duties, and wearing donut shoes, the 2017 Premiership winning coach was inspirational. 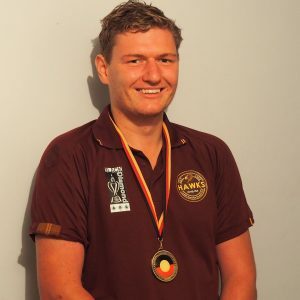 He won all his taps, bodied his opposition out of the quarter which allowed Spoory to win 90% of the clearances for the quarter. Besides being dressed like Happy Gilmore at the pub Spoory you had a solid day out son. After our 8 quarter display in the third term, the footsteps were coming late for us in the fourth. Credit to the Cats they played good footy in the final stanza and pushed us all the way. The Good Doctor Toby Marchart and Lashlie were zinging around the ground ensuring the ball was moving up and down the ground while Zac Cannington Dogs Moore made some great switches and key moves in the back pocket at crucial times. There were some pleasing ‘’12 point plays’’ from our team when we needed it the most.